You've worked hard for your amateur license, why not display it proudly in your shack? These certificates, 8 1/2 by 11 inches, are suitable for framing and are available to commemorate holders of Technician, General, Advanced, and Extra class, USA licenses. 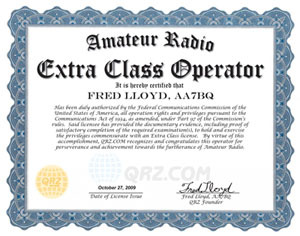 In order to qualify for these certificates, the license holder must have a current, valid USA amateur radio license. Platinum Subscribers get one free certificate per year! Orders are accepted both online and by mail. See the link above for more info.